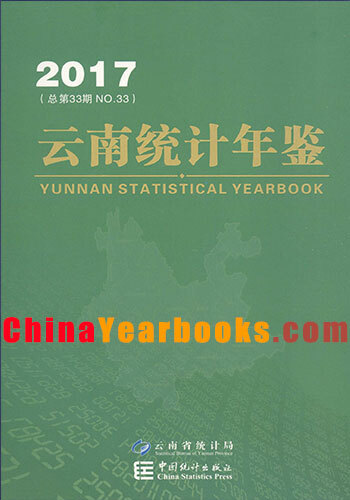 Ⅰ.Yunnan Statistical Yearbook 2017 is an annual statistics reference book which fully reflects the national economy and social development in Yunnan province.The present yearbook covers comprehensive data in each city,county and prefecture in 2016 as well as some key data in significant years of the whole province. Ⅱ.After revision,this book contains the following eighteen parts:1.Provincial survey;2.Economies;3.Investment in Fixed Assets;4.Urban and Rural Consumption;5.Public Finance;6.Foreign Trade;7.Agriculture and Country;8.Industry and Energy;9.Construction and Real Estate;10.Transport,Communications,and service Industry;11.Finance and Insurance;12.Tourism;13.Education,Science and Technology and Culture;14.Public Health,Sports and Social Services;15.Population and Employment;16.Resources and Environment;17.Survey of National Autonomous Area;18.Survey of Intra-county Economies. Ⅲ.Explanatory Notes on Principal Statistical Indicators are provided at the end of each part to describe the content,scope and method of provincial statistical indicators briefly.The major data in this publication are obtained from annual statistical reports.It is advisable to note in the reference that the sum of data of each city,county and prefecture may not correspondingly equal the total of the whole province in some statistical indicators due to different statistical ranges and investigation methods.As for changes of statistical ranges,the relevant data are adjusted and explained accordingly in the present yearbook. Ⅳ.The units of measurement used in this book are international standard measurement units issued by the state.Notations used in this yearbook,“(Blank)” indicates that the data are not available;or refers to numbers of minimum units or refers to numbers which are not in detail.“#” indicates that the major items of the total. Ⅴ.Thanks for the great support and attention given by party members and governments at each level,and colleagues who participate in this editing work.In order to perfect the yearbook and meet the requirements of the society better,comments from various readers are highly appreciated.At the same time,readers are welcome to correct our mistakes made in this book.